This sleek dock is your personal hub for all things iPad. Designed for iPad 2 or later, it gives you easy access to a port for syncing or charging, and an audio line out port for connecting to powered speakers via an optional audio cable. 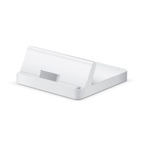 The iPad Dock also supports other iPad accessories, such as the Apple Digital AV Adapter and the iPad .